The movers are here -- they're packing up. It's a slow start, since it took some time to bring in all the packing materials. One of the guys had just rolled in this morning from a delivery to Arkansas -- so he's nursing the cans of Rock Star while he packs. So far they seem to be thorough. I think the head packer is nervous about getting this done in time for the truck on Friday. There are two guys here today, he's asking for two more tomorrow. 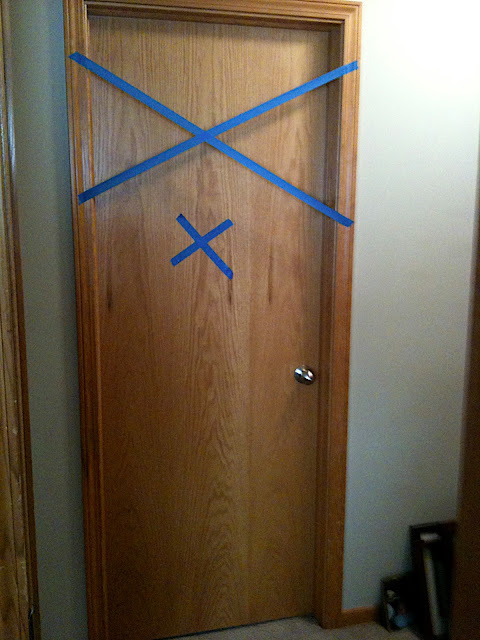 The Do Not Pack room has been obviously marked. But they aren't on the top floor of the house quite yet. Welcome to Omaha, Trader Joe's!! Okay, for me personally, it's a day late and a dollar short...since we're leaving in a week. I'm a huge Trader Joe's fan! I can't say exactly when I first went there. I know it was about 10 years ago and it was either the one in Commack, NY with my in-laws, or else in Falls Church, VA with one of my childhood friends, Naomi. If you aren't in the know, then you deserve a little background. Trader Joe's is a grocery store chain, with most of their locations on the east and west coasts. They are unique in that they market their own brands of many foods, many of which are very unusual. Such as pad thai kits, curry sauces, and pasta. Beer, wine and organic milk. They'll carry other brands too, but again, mostly on the unusual side. It's so much fun to shop there. The prices are very reasonable, and you know you're getting good food with minimal processing. Their fruit and nut section is so much fun. Their coffees are fair trade, many of them are organically grown. 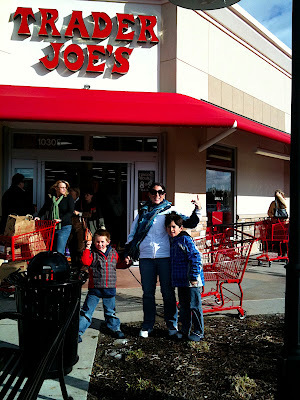 About 6 months after we moved to Apex, NC, a Trader Joe's opened up right up the road from our house. I was so excited to make TJ's our family's local grocery store. It was awesome! Then we moved to Omaha, and were once again without TJ's (although being near a commissary again helped). I saw a page on Facebook called "Bring Trader Joe's to Omaha" where several folks were trying to work with the company on bringing the store to the midwest. I guess TJ's need to put a distribution hub somewhere near here first. Because of that page, I knew this past winter that TJ's had taken a lease on a property in Western Omaha and on November 12th they had their grand opening. So here I am on November 13th, happy about there being a Trader Joe's nearby. Yeah, it was crowded! Fortunately, we knew EXACTLY what we needed: coffee, pasta, nuts and wine. Large volumes of each. We really enjoy the Charles Shaw wine and picked up TWO CASES of the stuff! Plus Jacob's favorite veggie ruffle pasta, an assortment of nuts for cooking and baking, and several large containers of their coffee. So I have my fix, which will carry me for several months as I make my way back into a Trader Joe's drought. Whether you knew of it as the APRS station DW3809 or as Wunderground Station KNEBELLE12, this afternoon we disassembled the weather station and will set it up in a couple weeks in Navarre, FL. I'm in the process of deleting our Wunderground tags from this blog and our Vollmer Family homepage. I hope you enjoyed this window to our world, especially in the winter when we could show off how much snow we got here. 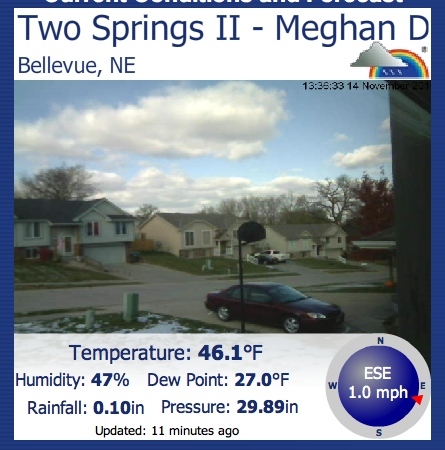 Not sure what kind of webcam view we'll have from our new house, we'll see!